On July 27, the White House and congressional Republicans released a joint statement of principles on taxes. The statement is intended to give momentum to a push for major tax legislation this fall. To bolster this effort, outside groups funded largely by the billionaire Koch brothers are preparing a “grassroots” lobbying campaign to push for tax cuts for corporations and big business. The statement of principles was gauzy and virtually devoid of any detail. But the plans that President Donald Trump and House Republicans have put forward provide a better indication of what kind of tax code changes they will seek to enact this fall. As Trump and congressional leaders travel the country to gather support for the undefined notion of tax reform, it is important to understand their tax plans and who they benefit. As this column notes, their rhetoric on taxes does not always map onto their substantive agenda. President Trump and congressional leaders will assert that their efforts are focused on middle-class families, but it is important to look behind the rhetoric at who will actually benefit. The tax plans that Trump and the House majority, led by Speaker Paul Ryan (R-WI), have recently proposed are both heavily skewed toward the wealthy. Half of the tax cuts outlined in the one-page tax plan that Trump released on April 26 would go to the richest 1 percent, according to the nonpartisan Tax Policy Center (TPC). 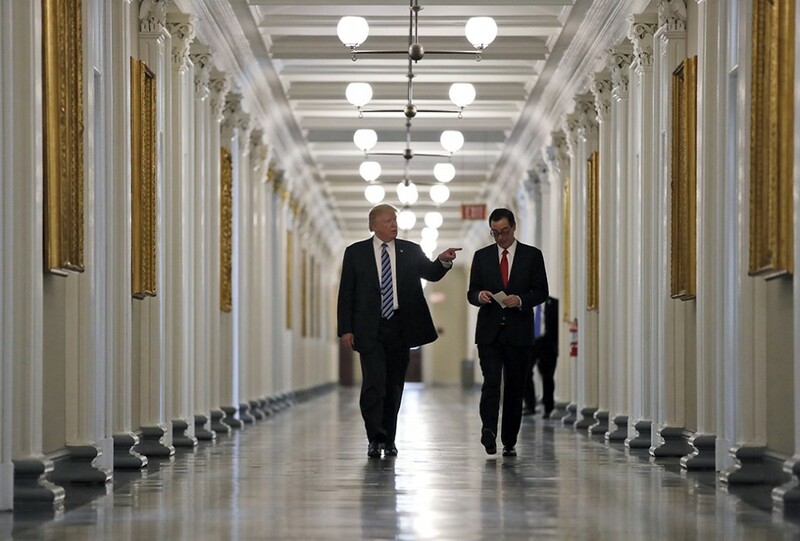 The Institute for Taxation and Economic Policy (ITEP), using somewhat different assumptions about Trump’s April 26 plan, found that 61 percent of its tax cuts would go to the top 1 percent. The richest 1 percent get an even larger share of the tax cuts in the House majority’s “A Better Way” proposal. In fact, the wealthiest Americans would receive virtually all of the net tax cuts when the plan is fully phased in. 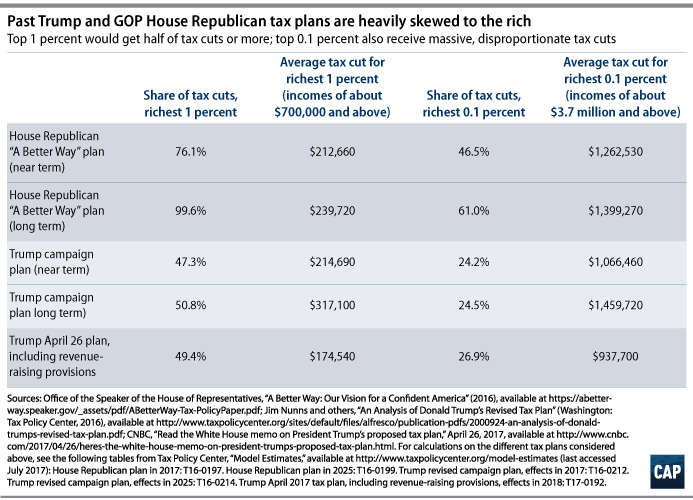 Figure 1 compares recent plans from Trump and the House majority, illustrating that they are both badly skewed to the top 1 percent—and indeed, to the top 0.1 percent—according to TPC. Importantly, these figures from TPC and ITEP reflect the net effect of the various tax cuts in the Trump and House majority plans and the proposals they have identified to eliminate deductions—including that both plans eliminate all itemized deductions for individuals except those for mortgage interest and charitable gifts. That includes one of the largest tax breaks, the deduction for state and local taxes paid. At times, Trump and administration officials have suggested that the White House tax plan will eliminate so many deductions that high-income individuals may actually see tax increases at the end of the day. For example, Secretary of the Treasury Steven Mnuchin said on July 31, “I sometimes get complaints from my friends in New York and New Jersey and Connecticut and California and Illinois that their tax rates aren’t going down.” This suggests that high-income individuals in those relatively high-tax states would lose at least as much from the elimination of the state and local tax deduction and other deductions as they would gain from Trump’s proposed tax cuts. But the math tells a different story. In fact, ITEP’s state-by-state analysis of the Trump tax plan finds that the richest 1 percent of every state receives whopping net tax cuts. For example, the richest 1 percent of taxpayers in New York, with incomes averaging $3.2 million, would receive an average tax cut of $177,000, or two-thirds of all net tax cuts for New York residents—despite the repeal of the state and local tax deduction. Reducing individual tax rates, as the plans introduced by both Trump and the House majority have proposed, also benefits the wealthy more than middle- and lower-income families. For example, the Trump April 26 plan proposes to replace today’s brackets—which range between rates of 10 percent and 39.6 percent—with just three rates of 10, 25, and 35 percent. This change would gift the richest 1 percent a tax cut that is twice as large, as a share of their income, as that given to middle-income families. Families at the bottom of the distribution do not benefit at all. Given the actual content of their recent tax plans, observers should be very skeptical of any claims from Trump and House leaders that their tax reform efforts are focused on helping the middle class and working families rather than providing a windfall to the wealthy. Instead of believing the rhetoric, follow the money. We can also expect Trump and the congressional majority to tout a proposal that they will call tax relief for small businesses; this proposal, however, is really a new loophole that will mostly benefit millionaires such as Trump, which is why some have called it the “Trump loophole.” The proposal puts a cap on the tax rate that owners of so-called passthrough business entities, such as S corporations, partnerships, and limited liability companies (LLCs), pay on income from those businesses. Under current law, the highest-income individuals pay 39.6 percent on both salaries and passthrough business income. Trump’s plan caps the rate at 15 percent, effectively cutting the rate on such income by more than half. The House majority plan caps the passthrough rate at 25 percent. While the vast majority of passthrough businesses are small, small businesses are not the primary beneficiary of the Trump loophole. In fact, 70 percent of business owners would receive no benefit from the special rates because they are already in the 15 percent tax bracket or lower, according to TPC. Eighty-six percent of passthrough business owners are in the 25 percent bracket or lower, and therefore receive no benefit from the provision of the House majority plan. Passthrough business owners with incomes of less than $200,000 receive only a tiny fraction of Trump and the House majority’s so-called small business tax cut. In fact, fully 68 percent of the benefit of the Trump loophole goes to millionaires—including President Trump, whose business empire is comprised of some 500 passthrough entities. The House majority’s version of the Trump loophole is smaller but even more skewed: 79 percent of the tax benefit goes to millionaires. A special rate for passthrough business income will also open up a massive new avenue for tax avoidance by the wealthy. Trump and congressional leaders probably will not provide much information about how they intend to pay for their proposed tax cuts. It is critical, however, that they explain their funding mechanism, as the tax cuts outlined in Trump’s April 26 plan total a staggering $7.8 trillion over 10 years and would cost at least $3.5 trillion once potential revenue-raising provisions are taken into account, according to TPC. The Institute for Taxation and Economic Policy estimates that the most plausible version of Trump’s plan would cost $4.8 trillion over 10 years, also taking into account the revenue-raising provisions that Trump and the House majority have proposed, including eliminating the state and local tax deduction. The House majority’s “A Better Way” plan costs $3.1 trillion over 10 years on net. * These staggering sums are all the more concerning because Trump and House leaders have already ruled out most of the major, revenue-raising reforms that could contribute to offsetting tax cuts of those magnitudes. The largest tax break for the wealthy—the preferential tax rates on investment income, including capital gains and dividends—is made even larger under the Trump and the House majority’s plans. The Trump administration and congressional leaders have stated that they will retain the major tax breaks for charitable giving, mortgage interest, and retirement savings. On the business side, Trump and congressional leaders propose to move toward “unprecedented capital expensing,” which would reduce revenue relative to current law, and toward a “territorial” tax system that would likely worsen the drain of corporate tax revenue into offshore tax havens. Congressional leaders and some members of the Trump administration are reportedly split on whether to pay for their tax cuts. On July 19, the House Budget Committee advanced a budget for next year that would fast-track tax cuts but require that they be paid for by either revenue-raising provisions or spending cuts. The Trump administration has vacillated back and forth between pledges to pay for its tax cuts or leave them unpaid. The Senate majority has not taken a consensus position, though some senators are reportedly pushing for 10 or even 20 years of deficit-financed tax cuts. Unless offset with revenue-raising provisions, tax cuts of this magnitude would increase deficits. Ballooning deficits would, in turn, increase pressure to cut public investments further and slash programs that support basic living standards, including bedrocks such as Medicare, Medicaid, and Social Security. Trump and the House majority have been fairly clear on the tax cuts they are promising to the wealthy and corporations, but much less clear on who will pay for them. The House budget resolution paves the way for “deficit-neutral” tax reform, which means that it leaves the door open for cuts to programs such as Medicare, unemployment insurance, and disability benefits to finance tax cuts for the wealthy. When it comes to how a major tax overhaul will affect the distribution of taxes, the overall effects—and not any one specific provision—are what is important. Both Trump and House leaders emphasize that their plans increase the standard deduction. All else equal, increasing the standard deduction would lower taxes and reduce the need for more families to itemize their deductions. However, all else is never equal in complex tax reform; without knowing the overall parameters of the plans, working families have no idea whether they will be winners or losers. The Trump and House majority plans eliminate personal exemptions—which are worth more to many families than the standard deduction—eliminate most itemized deductions, and place many other tax benefits on the chopping block. Even under the known parameters of the Trump plan, nearly one-fifth of all taxpayers—including nearly half of those taxpayers with children—would see their taxes rise. (see TPC’s detailed tables) That is remarkable given that the Trump plan reduces revenue by at least $3.5 trillion. A plan that is closer to revenue-neutral would see many more losers. The White House has also not provided any detail on how it proposes to help families afford child care. The child care tax proposal Trump put forward during the campaign provided only a paltry benefit to the families who need the most help affording child care, while providing a windfall to upper-income families. In sum, families cannot know how a tax plan will affect them based on an incomplete picture—but they should be wary, given that Trump and the House majority have promised massive tax cuts to the rich. We can also expect the Trump administration and congressional leaders to boast about how their tax plan will make tax filing much simpler and easier. Speaker Ryan and the House majority have two favorite talking points on simplification, both of which are transparently bogus. The first talking point references their plan’s reduction of the number of tax brackets from seven to three. But the number of tax brackets is utterly irrelevant to the ease of tax filing. The onerous part of filing taxes is determining one’s taxable income. At that point, calculating one’s tax is automatic for the vast majority of taxpayers (or their preparers) who use software, and is as easy as referring to the IRS tax tables for those who file on paper. While the number of brackets is irrelevant to tax simplification, it is highly relevant to tax fairness. In general, the fewer the brackets, the less progressive the tax code is. People with widely varying incomes are grouped in the same bracket, and high-income taxpayers benefit greatly from cutting the top rate. The second bogus talking point that the House majority often employs is that, under its plan, tax filing can be done on a postcard-size form. What it fails to mention is that, for tax filers with relatively simple returns, a postcard-size form already exists: the 1040-EZ. Other tax filers use the regular 1040 form, which is decidedly longer than a postcard, and its associated schedules and worksheets. The catch is that under the House majority plan, no matter how long the basic form is, there will still be a need for additional schedules and worksheets to determine what to put on it. And moving more calculations off the postcard and onto other forms does not save taxpayers or their tax preparers any work—particularly if they use software, which renders the size of the form irrelevant anyway. One clear way to reduce the number of lines on tax returns is to eliminate tax credits and deductions—but there, taxpayers will experience a trade-off between somewhat easier tax filing and the loss of tax provisions that benefit them and that may serve broader policy goals. Finally, Trump and congressional leaders will likely market their tax cuts using familiar trickle-down theories. For example, they and allied lobbying groups are likely to argue that cutting taxes on “job creators” boosts the economy, or that cutting corporate taxes trickles down to workers. These claims are not to be believed. Recent experience with top tax rates has provided a natural experiment. President Bill Clinton raised the top tax rate substantially in 1993, and the economy subsequently boomed. President George W. Bush cut the tax rate in 2001, and the economy experienced weak growth followed by a crash. President Barack Obama restored the Clinton-era top rate in 2013, and the economy has continued to grow despite the doomsday predictions of anti-tax conservatives. This experience does not prove that raising taxes on the rich leads to better growth or that cutting them slows growth, but it certainly provides evidence that the reverse is not true. Indeed, as economist Jared Bernstein has found, the U.S. experience since World War II shows no correlation between the top marginal tax rate and per-capita economic growth or growth in employment, capital investment, productivity, or pretax median family incomes. A comprehensive review of the economic research on tax cuts and growth by the Brookings Institution’s William Gale and Dartmouth College’s Andrew Samwick concludes that tax cuts are unlikely to have a substantial positive impact on growth and that deficit-financed tax can harm growth. Nor is cutting corporate rates or allowing tax-free repatriation of profits likely to create jobs or boost incomes. Recent state-level experience also provides cautionary tales for proponents of trickle-down economics. In 2012, California raised taxes on the highest earners—single filers earning more than $250,000 and couples earning more than $500,000—making the top-bracket income tax rates the highest in the nation. That same year, Kansas approved a major tax cut skewed to the top earners and business owners, in what Gov. Sam Brownback (R) called a “real live experiment” in supply-side tax policy. Since then, California has enjoyed among the strongest economic growth of any state, while Kansas has lagged behind the nation and neighboring states in economic growth and jobs. Kansas’ tax cuts have severely worsened the state’s fiscal situation, resulting in deep cuts to education and other state services. Kansas-style tax cuts at the federal level are more likely to repeat this failed experiment than to trickle down to workers in the form of jobs and higher incomes. In sum, the Trump administration and congressional leaders’ rhetoric on taxes should be met with skepticism on a number of scores—especially if they try to portray the focus of their plans as anything but a major tax cut for the wealthy and corporations. Author’s note: TPC’s estimate of the House majority’s “A Better Way” plan includes an about $800 billion revenue loss over the next decade from repealing ACA taxes. Given that ACA repeal has stalled in the Senate, it is uncertain whether Trump and the congressional majority will continue to seek to repeal those taxes in their tax code overhaul. However, TPC’s estimate also includes about $1.2 trillion of increased revenue over the next decade from the border adjustment feature of the House majority’s plan, which has since been discarded. Seth Hanlon is a senior fellow at the Center for American Progress.